Today is the day that Google makes the shift to give SEO ranking preference to mobile optimized sites over desktop sites that are not optimized for mobile. Organic search is typically a highly qualified traffic driver for brand websites. Mobile visitors tend to average around 50% of all search traffic, which means creating a mobile-friendly website is an absolute must. It’s no longer a debate as to whether your brands’ percentage of mobile traffic is worth budgeting for a mobile presence online. According to Comscore, mobile accounts for over 30% of all Internet usage in the US in 2015, and is continuously growing year-overyear, while desktop is beginning to dip. Google understands the exponential growth of mobile usage and has determined that mobile accessibility is of the utmost importance for brands. Which is why Google has changed how they rank and display sites? The update will now negatively impact search results for any website that isn’t considered ‘mobile-friendly’ and is rumored to have a greater impact on search results than their previous two updates, Penguin and Panda, which impacted roughly 12% of all search results. If your brand has a website, and organic search rankings are an important traffic driving digital channel, then you need to cater your website to mobile users. Mobile-Friendly Labels Back in November, Google began to include mobile-friendly labels to websites they considered optimized for smartphone devices. These labels are slowly being replaced by icons to denote whether a website is mobile-friendly, or more specifically non-mobile-friendly. Google yourself and see how your site has been labeled. 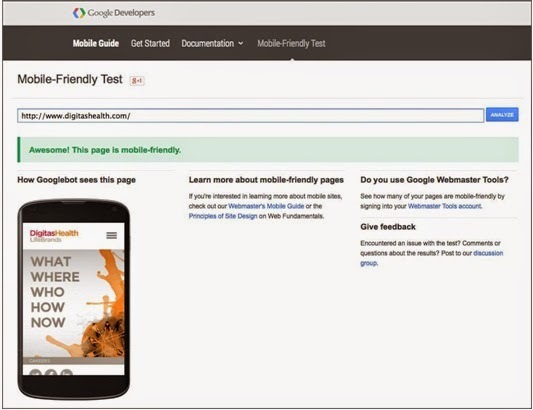 Mobile-Friendly Test Google has also created a tool to test whether your site is considered mobile-friendly. Enter in your URL and get your results along with a few tips as to why your website may or may not be labeled as mobile-friendly. Responsive Web Design: uses different style sheets to reformat how your website displays across multiple devices. The actual website content, and subsequent HTML will remain the same across devices, however, it is possible to rearrange, hide, or display specific content depending on screen size. Adaptive Design: can detect a specific device and dynamically serves users different versions of the website which are tied to specific devices. Like responsive design, it still uses a single URL across devices. Standalone Mobile Websites: have unique URL’s which have historically existed as an m.domain. These technically exist as a completely separate website from the desktop version. There are pro’s and con’s to each method of developing and designing a mobile-friendly website. 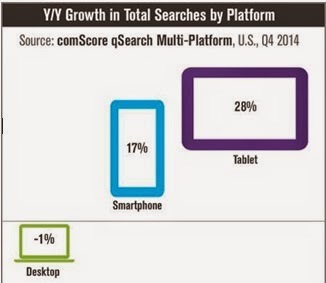 Responsive is currently Google’s preferred method and is also the easiest to maintain. However, while it can transform your web design to display well on mobile devices, it won’t transform the content to fit your mobile users’ needs. The debate over whether a brand should consider a mobile-first approach to their digital marketing efforts is now a foregone conclusion. However, the debate over whether healthcare brands should be integrating a mobile app into their mobile strategy is still a hotly debated topic amongst marketers. As part of their latest update, Google will feature more relevant app content directly into their search results. Google’s API, as well as a few other methods, allows apps to deep link to one another or to specific website pages. As a result, this will effectively improve discoverability and accessibility of mobile apps, as they will begin to tie in-app engagement metrics to search result rankings. Google has made their stance on mobile very clear. Developing a mobile-first digital strategy is no longer a consideration, but an absolute must. Pharmaceutical brands who do not have an optimized mobile website need to allocate budget to redesign all web assets to be mobile-friendly. As the trend towards mobile continues to shift, brands should also begin to consider developing a mobile app experience before the next Google update is announced.